This review first appeared in the September 2014 issue of hi-end hifi magazine fairaudio.de of Germany. You can also read this review of Electrocompaniet in its original German version. We publish its English translation in a mutual syndication arrangement with the publishers. As is customary for our own reviews, the writer's signature at review's end shows an e-mail address should you have questions or wish to send feedback. All images contained in this review are the property of fairaudio or Electrocompaniet - Ed. Cast a cursory glance at this review’s opening pix and you might think we’ve finally succumbed to reviewing unholy televisions. No worries. That I did play telly in the crib was simply due to today's tester streaming not only audio files but also video at HD1080p resolution. That we cover that feature merely in passing is a given—we’re not fairvideo—but also because of the Norwegian’s positioning. It appeals to the high-end music lover who occasionally wants to watch video, not the home cineast who here and there also listens to tunes. 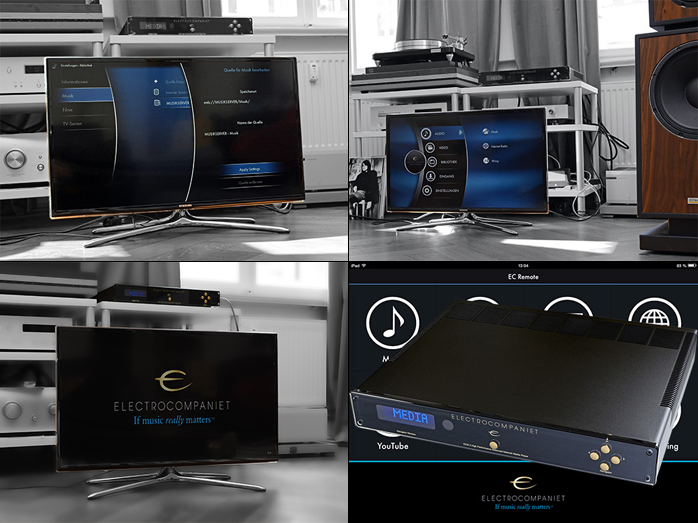 That’s indicated by the fact already that Electrocompaniet’s ECM2 network player looks virtually identical to their ECD2 DAC we reviewed last year and actually is based on the very same converter. Hence the D/A and output stages are shared. One item the network player sheds is the USB port for PC/laptop connection. That's because what is beneath the ECM2’s hood is a very compact computer. Of course we still get two each coax and Toslink inputs. With those ports the deck works like a conventional DAC. The internal computer runs on Linux whilst the media streaming software loaded to it was written in house and is based on XBMC Media’s Center/Kodi. Where the streaming-enabled ECI 6DS integrated amplifier still ran an Audivo board, the ECM2 benefits from a proprietary solution. Electrocompaniet’s acquisition of Kopera Development has brought an entire firm that is specialized in computer know-how for the audio/video streaming sector under their own roof. Obviously this doesn’t just benefit today’s model. Rather, the company is primed to enter the category of streaming and multi-room distribution at ever greater depth as previewed with their EC Living range at this year’s HighEnd Munich show. Against such ambitions it is most sensible to secure the relevant in-house resources rather than rely on 3rd-party vendors. Back to the ECM2. One glance at its assets reveals a plethora of connectivity options. Integration with the domestic network is via wired Ethernet or WLAN antenna. Once set up, it processes data incoming from a NAS or computer, countless Internet radio station or—particularly interesting since it delivers CD quality—the WiMP/TIDAL streaming subscription services (more about those anon). Do you store your music or videos on USB sticks or hard drives? There are four inputs just for you. 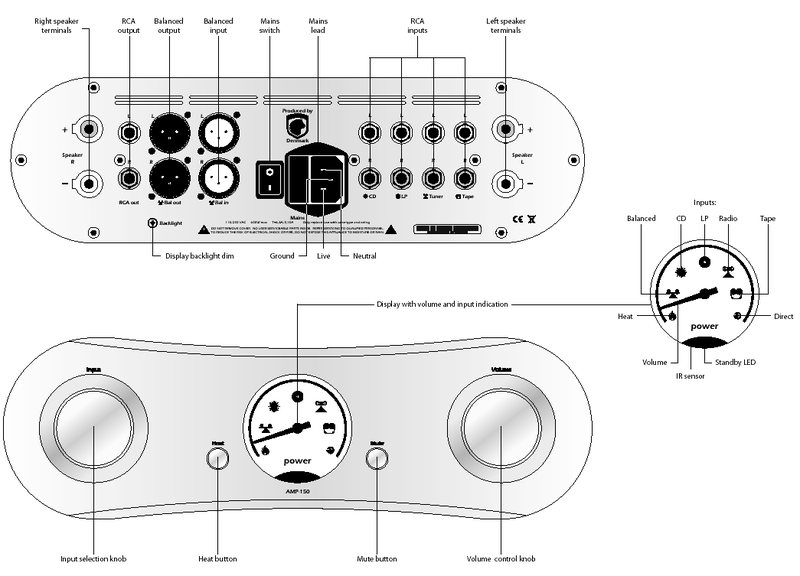 That’s above and beyond the already mentioned four S/PDIF sockets. Your telly will obviously leash to the HDMI port whilst the variable analogue output signal is available on RCA or XLR. Flip the beast belly-up and you’ll spot the bay for an optional hard disk. In stock guise the ECM2 is delivered without but a dealer or end user can easily add one. One expects many will go that route and turn this Norwegian into a type of digital juke box. That one isn’t locked in and instead free to select type, size and brand of hard drive is commendable. My test sample came with a conventional €100 2TB drive from Western Digital but SSD variants will work just as well. At time of publication, setup still relied on an HDMI-connected television but an iOS/Android app update was already announced for a few weeks later. The ECM2 starts it TV show with a setup wizard which runs through all the necessary steps in a few minutes. This locks in choices like country, language, network connections etc. That bit proved child’s play. Afterwards one is nearly ready to rock. ‘Nearly’ means that the streamer still must be told where your media library is housed and what it’s called. The ECM2 views each type of data source—internal drive, external drives, network-connected drive, USB drives/sticks—as a discrete library. Any drive built into the deck gets automatically formatted and added to the list of network libraries. External libraries need to be added manually which merely requires a few prompts on the remote.